The EL25 is beautifully engineered for private residences, yet powerful and adaptable enough to be used in apartment buildings, condo complexes, office parks and commercial sites. The EL25 is capable of accepting up to 2000 totally flexible codes, making the EL25 ideal for virtually any installation. Unlike other systems, the EL25 may be purchased as a base unit or can be ordered with optional plug-in modules. This allows you to choose only the plug-in modules you need depending on the specifics of the job - enabling you to offer custom solutions right off the shelf without special orders. Do Not Disturb - Assignable on a tenant-by-tenant basis, this may be programmed through a touch-tone phone or via a pre-programmed time schedule. Call Forwarding - Allows each tenant to grant or deny access from a remote location. Feature may be set manually or time-activated to occur automatically. Security Lockout - Locks out all users for a programmable period of time if several invalid code attempts are made. 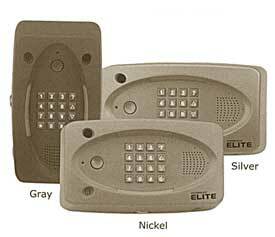 Alarm can be set to activate if the gate or door is held open or forced open. Automatic Gate/Door Unlock Schedule - Entry points may be configured to automatically open or lock at set time periods.